Have you ever noticed how there are special connections that help create friendship? These are special bonds that tie the friendship together. With some friends it may be a love of afternoon tea, travel, quilting or stitchery, or the common bond of raising children. The unique connections are very meaningful to me and help me treasure my friends even more. One of my friends is Elizabeth Joy. Together we love wildflowers and often search the same mountain hillsides for the first blooms of spring! When I think of wildflowers, I think of her! Every winter I find myself longing for spring. I just love the warming rays of sun and the wildflowers that start to open. It is my favorite time of year. Wildflowers bring me so much joy. 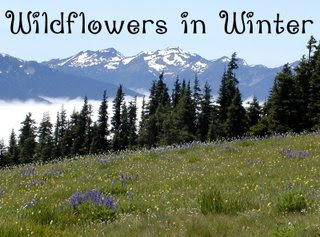 So, I propose some wildflower fun this winter to take us into the first days of spring. I will have a different theme each week through the middle of March. Join right in by making a post on your blog fitting the theme. She gives more instructions on her blog and will be having a drawing in March where she will be giving away a set of handmade wildflower cards that she is making. It will go to one of the participants in her Wildflowers in Winter Weekly Theme event. I'm delighted to join her in this venture! Would you like to join too? It would be fun to see what wildflowers are your favorites in your locale. Let's see if we can find participants from all over North America, Europe, Asia, Africa, Australia and South America. Antarctica is welcome to join in as well, but I'm not sure there are wildflowers there. Are there? I love wildflowers, too. There are many interesting wildflowers in Central Europe. I cannot draw very well, but I could show photos and write a haiku about the flower. Yes, I would like to participate in your project. Oh, I do welcome bloggers from outside the USA. I would just love to see your wildflowers and learn all about them. At this time I can't travel to your wildflower trail, but maybe you can take me there with your blog. I think it would be wonderful! Oh, this sounds like fun! I'm very fond of my prairie wildflowers so I will go check out Elizabeth Joy's blog to see how to participate. That sounds like a wonderful project. I am so blessed to live in a place where wildflowers exist throughout the winter.